The breakfast view from our first lodging spot in Bohol. 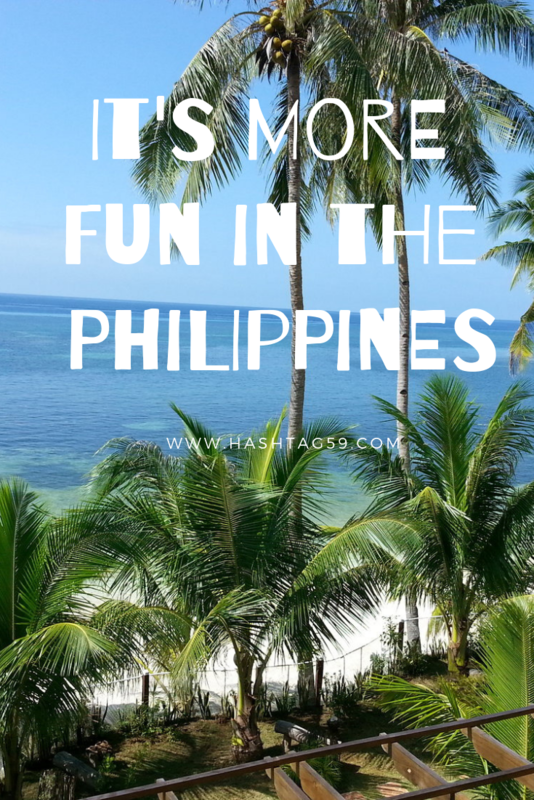 “It’s more fun in the Philippines” is the national tourism tagline of the country and it stands true when you take a visit there! It would be impossible to share in a blog how to visit and see the country that has over 7,000 islands in it! (7,641 to be exact according to the latest count.) Instead I will share the story of my trip there and give you a taste and glimpse of this beautiful country and amazing people that makes this one of the best destinations to consider when planning a trip to Southeast Asia. One thing to keep in mind is with over 7,000 islands there’s not exactly a nice bullet train system like in Japan so you won’t see it all. Just embrace the fact that what you will see gets to be an experience that will carry on with you forever. I hope by sharing some of mine with you that you feel inspired you to go seek out your own! Why did we decide to fly around the world to visit this country? It’s simple really. My wife and I’s great friends Jeff and Heather (she is in the picture above with our driver who Mario who awaited our arrival via ferry in Bohol) lived there for several years. From the second they moved there it was on the list to go visit them. They have since moved back to the states and I’ll be honest if I wasn’t a tad bummed that we only did one trip to Asia to see them. I think one of the best ways to see the world is to go visit your friends who are located in the nooks and crannies of the planet and experience a trip to go see them. How did we decide where to go? Bohol. One of the more frequented and talked about islands and areas in the country. From there we’d be able to visit several parts of the islands and go on side day trips to see other islands. After all there are over 7,000 of them like I mentioned. We managed to visit 5 of them. Not bad for ten days! Cebu City. This was our arrival and exit point to get to Bohol. Which required a ferry from Cebu City. We stayed at a really funky and quaint hotel in the area and were able to explore that neighborhood but overall it’s a big city and more of a launching point. Subic Bay. This is where our friends lived for part of the time overseas and it’s an old American naval base. It was fun to go see where they lived and the school they taught at. It has an interesting piece to the PI and American history and it was honestly fun to see and experience. Oh yeah…we got to fly into Manila and experience the wildest three hour traffic jam in downtown Manila that would make LA, Delhi, or London regulars beg to get out of! The People of course! We brought over some “American beers” for Jeff since San Miguel is really the only beer you can get a hold of in the country. Think a classier Busch Light :). Our bartender at our first lodging in Bohol couldn’t believe how “thick” the beer tasted. We had brought some Colorado IPA’s and Rockmill Saison. It was funny to hear the reaction. That was just one of dozens of great intimate experiences with so many wonderful and amazing folks who made our journey so special. The oceans and exploration. The snorkeling rivaled if not surpassed what I did in Belize and St John in the USVI which are long considered two of the best snorkeling spots in the world. We saw bright blue starfish, a school of several hundred jackfish, dove into hot springs, and island hopped on old school PI boats. The exploration of the water in the PI is something that really makes this country unique and a MUST VISIT. 3. The Chocolate Hills are a MUST SEE according to the Bohol Tourism sites. Honestly they are okay and make for a cool picture but more fun is a day trip to the small towns in Bohol and connecting with the people and the cultures of the PI. The Chocolate Hills are going to be seen one way or the other if you decide to do this venture but it’s the other stops on a Chocolate Hills tour that were my favorite. We hired a private driver for the day and it was affordable, convenient, and fun. 4. The Tarsiary Sanctuary was one of my favorite “other stops” on our Bohol land tour. The smallest primate in the world is seriously amazing to witness in person and especially at a place where they are protected and safe. It was a fun experience and I would really recommend this stop! 5. Playing Hoops! This what I love about traveling. The ability to do some random activity and connect with people in a part of the world you have never been. They love basketball in the PI, especially the NBA! We so more old school NBA jerseys than I could count and whenever someone asked where we lived we simply told them “In Ohio near Lebron James” and they knew what we meant! All week long at our lodges the locals asked if we would come play hoops with them on Easter Sunday because everyone would be off work. We went up late afternoon and word got around that the “two gringos” in town were at the court. Literally within 30 minutes there were dozens of folks ready to play, watch, and hang out. b. They don’t like playing defense lol! I would find my whole team on the other end cherry picking and waiting for my outlet when I played 5 on 1 defense. Fortunately it happened the other way around as well and we had several 5 on 1 fast breaks against Jeff’s team with Jeff acting as lone defender of the hoop. We played several games and after a few hours headed home. It was one of my favorite international travel experiences I have ever had. Ralph took us snorkeling, cooked us dinner, drank beers with us, and engineered a day long boat tour with a large group on my birthday. He is from Germany and was a hoot…once again…the people and the cultures and experiences are what I love about my travels and Ralph and his wife J Lo were no exception! Private snorkeling day trip with Ralph. One view from my day long birthday boat trip with Ralph. We visited 3 other PI islands, went snorkeling, swam in hot springs, I received a birthday cake, and we almost left two other German tourists on an island because they were scuba diving. Luckily my wife did a headcount! 7. My birthday cake. J Lo (Ralph’s wife) all of the sudden called me “Rudd” one morning when I saw her. I thought it was interesting that she knew that my last name and most of my friends called me by that. However I soon got lost in coffee and a beach run and forgot about it. In reality she called me that because my friends had ordered a birthday cake and she was the one who went out and got it from a local baker in her neighborhood. Since she had told them the inscription on it she started calling me that. When she said it Jeff & Heather were worried I would think something was up…but it went totally over my head! It was a special day and way to celebrate my 32nd birthday and I will forever be grateful for the experience I received on that day! 8. Back in Cebu City I really recommend that you stay HERE at The Henry Hotel. This boutique hotel had so much flavor and energy. This photo was and is the closest I will ever come to landing a punch on Manny Pacquiao. For those that aren’t familiar he is from the PI and is basically a National Hero. If he ran for President I think he would win and when his boxing matches would happen the whole country would shut down and watch or listen on the radio. The only athlete in the world that can get someone from the PI to turn off a basketball game is Manny P.
Don’t forget to take a ride in the PI’s much cheaper and more dangerous version of a taxicab! The Trike Bike! If you ever venture to Subic Bay you will have a hard time not seeing monkeys or these fruit bats, they are everywhere! Why should you go here and what are my final thoughts? For me this trip was done to go see our friends and to selfishly jump in for just a small snippet of their amazing multi year experience of living in a country halfway around the world. I have always thought about doing something like this and I loved and adored the fact that they made my dream a reality. The PI is a wonderful place with so many places to see and things to do. I hope this gives you some ideas on why you should make a visit there but more importantly why you should continue or start to travel the world. And not by just visiting the “most popular” or “easiest” places to get to. This trip was long, hard, and exhausting but it showed us a part of the world that most will never go see. For me that is worth everything and the reason in which I love to travel and honestly why I started Hashtag 59 with Amy in the first place. We want to share and inspire others to see the world and connect with different people and cultures in a way they never thought possible. This trip was no exception and I can’t wait to go back! Have you been to the PI?? Post your experience in the comments below and thanks for reading. Sign up for our email list below to receive our latest content, contests, and events in one email per month on the last day of the month.